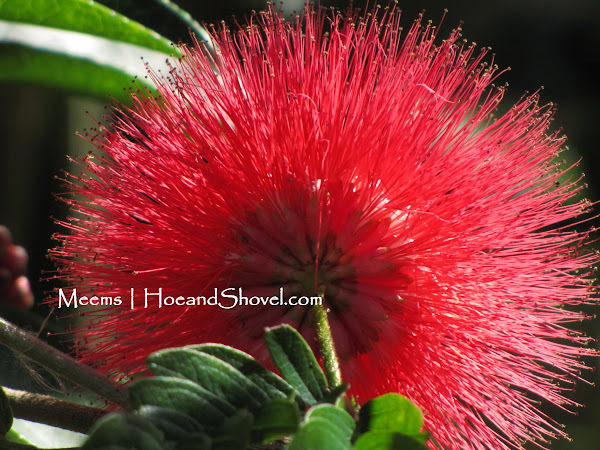 Powder Puff (Calliandra haematocep​hala) an evergreen shrub with multi-branching formation that saves its glory for the deepest parts of winter. I love that. 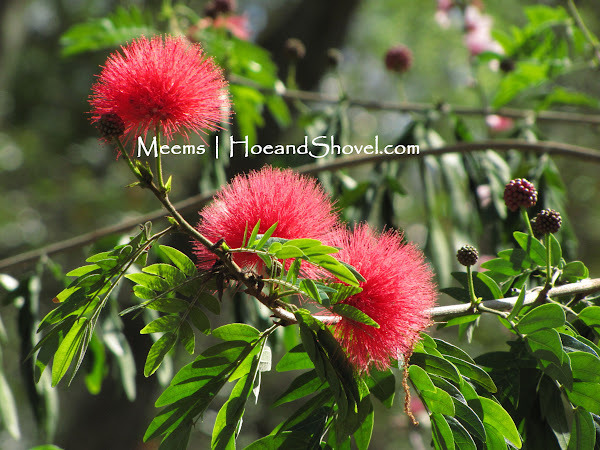 Bright, red, puffy pom-poms lining each drooping branch for every moment of three months. Bees and butterflies are big fans, too. This is the first year in three that the cold weather hasn't knocked it back. So beautiful to see it in its full strength and brightness mid-winter. It is happy in the sunshine or partial sun. Mine is planted in the middle of the northside berm with tea olives behind it and portodora in front. How very tropical of you. I love it. It remindes me of a Mimosa. The closest thing in my part of the country. I hate to complain, but this new way of word verification is going to limit my comments. Not only on yours but on every Blogger that I read. Geez. I have had to do it three times. I will try once more. Mine has been blooming on and off all winter.It got a little burnt by this past cold front,but has already started reblooming. 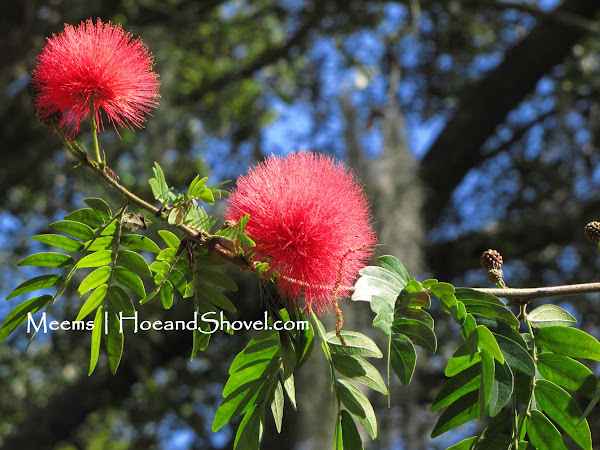 The Calliandras are winter into spring bloomers here in the tropics. They are such a common plant that we do tend to take them for granted. I've been on a search for the white variety for ages now, as I've got the red and pink. 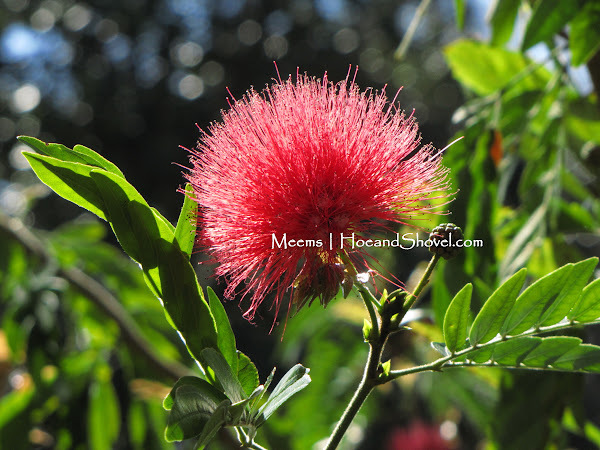 They really are a stunning shrub when in full bloom. Love your photos. Wow! That's one bold bloom! What a wonderful way to see winter off!!! Love it! I have been waiting for them to arrive at nurseries so I can get one. I live in the Tampa/St.Pete area so would love to hear if anyone has seen them yet this year. I wish I could grow Calliandras here in the UK. Very beautiful. Love those blooms. I have the white powder puff, grown from seed. We really haven't had much of a winter. What a great pop of color! How beautiful Meems! I just adore those fluffy blooms. I love my Mimosa blooms in summer but your red blooms are so much prettier. A lot of people have them down here and some years they get frozen back. I also just have loved Tea Olives as our grandmother had them in her yard in South Carolina and they sure smell good. Beautiful! Another benefit of a mild winter. Chris, Don't you love seeing all the flying critters hanging around it when the sun is shining! It's been exciting to see blooms on all the winter bloomers that haven't made it the last few years due to more than a few cold snaps. 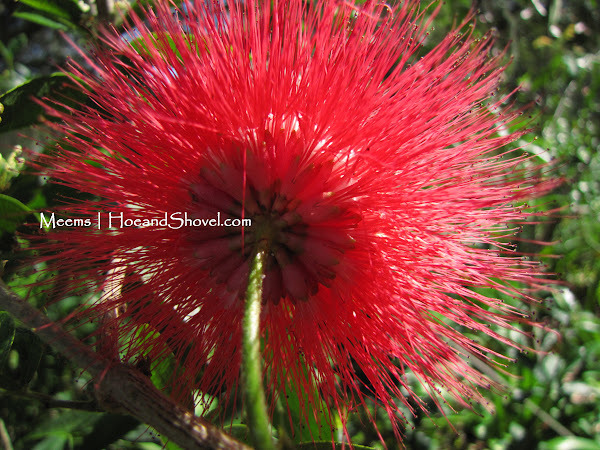 You might start seeing them since many of the garden centers get their tropicals from south Florida. Keep your eyes peeled. I'm impressed... grown from seed! Not much of a winter at all... more spring-like than winter! My tea olives have been blooming for weeks. But they bloom even if it freezes. I never even heard of them until a few years ago... not so widely used here. But they are gaining in popularity. We are being spoiled by this winter I think... it's going to be interesting this spring/summer.